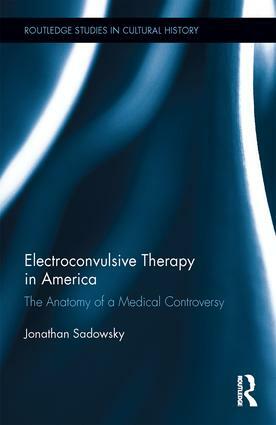 This week on the blog we’re highlighting an interview with Dr. Jonathan Sadowsky about his new book Electroconvulsive Therapy in America: The Anatomy of a Medical Controversy, released November 2016 by Routledge. The book (available here) follows the American history of one of the most controversial procedures in medicine, electroconvulsive therapy (ECT), and seeks to provide an explanation of why it has been so controversial, juxtaposing evidence from clinical science, personal memoir, and popular culture. ECT is widely demonized or idealized. Some detractors consider its very use to be a human rights violation, while some promoters depict it as a miracle, as the “penicillin of psychiatry.” Sadowsky contextualizes the controversies about ECT, instead of simply engaging in them, making the history of ECT more richly revealing of wider changes in culture and medicine. He shows that the application of electricity to the brain to treat illness is not only a physiological event, but also one embedded in culturally patterned beliefs about the human body, the meaning of sickness, and medical authority. Dr. Sadowsky is the Theodore J. Castele Professor of Medical History at Case Western Reserve University in Cleveland, OH, the Associate Director of Medical Humanities and Social Medicine, the Medical Humanities and Social Medicine Initiative co-founder, the Associate Director of Medicine, Society, and Culture in the Bioethics department of the Case Western Reserve University School of Medicine, and on the Editorial Board here at Culture, Medicine, and Psychiatry. Sadowsky’s research concentrates largely on the history of medicine and psychiatry in Africa and the United States. His previous publications include Imperial Bedlam: Institutions of Madness in Colonial Southwest Nigeria (1999), available here from the University of California Press. From all of us at CMP, we hope you enjoy our new interview category! For someone who is thinking about reading your book or about to start, is there anything you would like them to know beforehand? I would urge everyone to understand that not everybody’s experience of a medical therapy is the same. People should be careful not to generalize from experiences they’ve had, or that loved ones have had, and assume everyone has had the same experience. People who’ve had bad experiences with ECT have criticized me for to wanting to pay attention to the voices of people who’ve had good experiences, and people who’ve have good experiences have wanted to say “oh sure that might have been true in the 1950s but everything’s fine now.” ECT has a complicated story. I have met people who have told me that this treatment saved their lives and that it did so with either none or only the most mild of adverse effects. Those people are very concerned to make sure that the therapy gets represented in positive light because there are so many negative depictions. At the same time I’ve heard from and spoken to people who say they’ve lost 20 points off their IQ after having this treatment, or who had huge gaps in memory, or that they know somebody who had killed themselves after an ECT treatment. And what I find a little bit puzzling still after all these years of working on this book, is the way people are so unwilling to see that other people might have had a different experience than their own. But it’s my feeling as a social and cultural historian that it’s my responsibility to take into account all voices. So that’s the main thing that I want people to know and think about, that experiences of this treatment do vary and people shouldn’t be too quick to generalize from their own experience. How did you become interested in ECT? I was already several years into my career as a historian of medicine, and in particular psychiatry, and had no knowledge of the treatment other than the images that many of us have from movies like One Flew Over the Cuckoo’s Nest. Images that it was a highly frightening and abusive treatment. I was a well-trained student of medicine and psychiatry and I didn’t know anything more than that. And then I began to hear stories, both from patients and from clinicians, about it being a valuable treatment and that was just so intriguing to me. So I began to look at some of the clinical literature and it was represented in almost completely the opposite way, as this safe, effective, humane treatment that’s been unfairly stigmatized. I felt like these were two completely distinct realities. It wasn’t so much that I wanted to reconcile them, but I just wanted to understand how views of this treatment became so bifurcated. And that became the central goal of the project: to understand why it became a controversy and have such strongly held opinions on either side. What did you find most exciting to research and write about? I worked on this project for a long time and one of the things that sustained me was that there are so many different angles to it. I was interested in learning about how it was used to treat homosexuals in 1950s, to see what the reaction of the psychoanalytic community was, and how it figured as a symbol for all that was worst in psychiatry in the antipsychiatry moment. And then there were all the debates going back to the inception of the treatment, ongoing continual debates about the extent of memory loss. Is it a serious problem? Is it a rare problem? These debates are still raging. All of this I found so intriguing. The history of ECT is also replete with ironies. Such as the irony that it was developed initially as a treatment for schizophrenia based on a hypothesis that schizophrenia has an inverse relationship with epilepsy. That hypothesis is no longer even believed in, and schizophrenia is not the main indication anymore, and yet it’s effective. That’s so weird and so seemly random! Another irony is that this treatment which become an icon for frightening medical treatment, and became almost like people’s haunting nightmare of how medicine could abuse you if you came into its clutches, was initially developed as a way to try to create a safer, less frightening treatment than chemical convulsive therapy. So it’s these layers of irony that I just found so interesting and kept me intrigued in the book. Did you come across anything unexpected? Yes, I did come across things that were unexpected. I found the gender politics to be very elusive. I found very little evidence for the idea that women were given ECT for simply protesting against their social role as housewives, which was promoted in another book on ECT. But it does appear likely that over the course of the treatment’s history more women have gotten it than men, and there is likely a gender politics to this. Minimally it may mean simply that more women are getting diagnosed with depression, and that’s the main indication. And we know that. The diagnosis of depression has predominated among women. There is a darker possibility, which is that women’s cognitive abilities haven’t been as valued, and so doctors have been more willing to use a treatment that might damage cognitive abilities on women than they were on men. I didn’t see any proof for that. But I think there were suggestive circumstances that might indicate that that played a role. In many realms of medicine, and this has been really well documented by historians, anthropologists, and sociologists of medicine, women’s complaints about medical treatments are more quickly dismissed than men’s complaints. So it’s quite possible that some of the complaints about memory loss, which have persisted throughout the history of this treatment, have been taken less seriously because they were so often voiced by women. I’m not arguing that women had more memory loss than men, but if they predominated in the treatment, and there were complaints about memory loss, it is plausible to suggest that perhaps there has been too much dismissal. I didn’t have evidence such as clearly sexist language in clinical reports that would strengthen a speculation like that, but one thing I do argue in the book is that the history of ECT is filled with doctors dismissing patient complaints of adverse effects. There are a number of ECT providers now, however, who are trying to be very sensitive to these complaints about memory and cognitive deficits following the treatment, but there still exists in clinical manuals the claim that serious memory problems are extremely rare, and that rarity really hasn’t been proven. So it remains a problem. The history of ECT treatment has shown a tendency to dismiss patient complaints about adverse effects, and this has not served anyone well. If anything, the tendency to dismiss complaints has worsened the stigma attached to the treatment. It’s understandable that some clinicians might feel some defensiveness for a treatment they feel is helpful and safe, but the dismissal of complaints of adverse effects has led to embittered patients and worsened the stigma. In a recent piece in The Conversation (available here), I argued that if we wanted to spell the stigma attached to ECT, it’s going to take more than attesting to its therapeutic efficacy. It’s going to mean we have to reconcile with its full costs. Why was it important for you to try and remain neutral and not argue for or against ECT? I’m not trying to presume objectivity. Everyone has a point of view. But I thought I could tell a more interesting story by taking a step back and making the controversy itself my study rather than becoming a disputant in the controversy. There’s some precedent for this. Didier Fassin, an anthropologist, did a book on AIDS in South Africa, When Bodies Remember (available here), in which he did the same thing; he tried to look at the structure of the controversy. He was trying to understand the medical controversy over HIV as an anthropologist, even though he did actually side more with one than the other. But I do argue in the book there are good reasons to attest to efficacy of ECT and it is a valuable part of psychiatry’s repertoire, that it has a place in medicine. But I also argue that there were good grounds for people to contest it and have fear of the treatment. I really try to resist the view, which is very common in clinical literature on ECT, that opposition to ECT is irrational. There are rational reasons for the resistance rooted in some of its historical uses, some of which were abusive, and rooted in the experiences of adverse effects. At the end of the book I lay it all out and I say exactly what I think about ECT after trying to look at it from a step back. I think it’s an invaluable part of psychiatry and could be very useful for many people. But I don’t think it should be used as a first or second resort; other things should be tried first because there are risks. I’m glad it’s there if I should ever need it, but I hope I never need it. Would ECT be perceived differently if it didn’t treat the brain but some other organ? Probably. In our society now, more than any other organ your brain is you. It is the seed of the self in our self-conception. I would go beyond that. The side effects do occur, without making any kind of representation about how common these problems are, but at least some people do experience permanent memory losses. I used a lot of patient memoirs in the chapter on memory as my source material. And as one of the memoirists wrote: We are our pasts. You lose your memory it’s like you lose a part of yourself. I think in some ways people feel they lose a part of themselves if they lose their memories more than even if they were to lose a limb. Losing a limb is very traumatic, I don’t mean to minimize that. But in a way, you lose your leg and you say “I lost my leg.” It’s something that belongs to you, but it isn’t you in the same way that maybe you feel your memories are you. Memories are not just something that you have, they’re something that you are. I think ECT is a treatment for the very ill and as a society we do generally accept that treatments for the very ill sometimes involve radical interventions. Chemotherapy for cancers for example. Most of us are glad we have it, and there isn’t a large anti-chemotherapy movement. My leading theory for why ECT treatment occasions this kind of resistance is because of depression’s uncertain status as illness. No one disagrees that cancer is an illness. When you have cancer you accept that you need surgery or radiation or chemotherapy. These are things that you normally wouldn’t do to your body if you were healthy and you didn’t need them. Cancer is clearly different from normal. But depression has this ambiguous status for two reasons. It is an ambiguous word in the English language because it refers both to an illness which can be extremely severe, yet it also refers to a mood that’s normal and that everybody at some point in their lives gets a little bit depressed. We might have disagreements about how long it has to go on and how severe it has to be to be considered an illness. But it becomes something different when we call it an illness. Secondly why I think depression’s status is a bit uncertain, is that there continue to be people who reject medical models for what we call mental illness altogether. Some might believe what people need is talk therapy and they shouldn’t have drugs or shock therapies or anything like that. Some might believe that they don’t need any treatment at all; they might want to de-medicalize the entire thing. For example, for something to qualify as disease, there has to be some kind of lesion, or something physical that can be identified. Since we don’t have the means to do that with depression, it should be removed from the medical realm. I argue against this view. The idea that there has to be some kind of visual marker is arbitrary. I do think what we consider an illness is a social decision. But if you look at it historically and anthropologically, the idea that things we call madness are medical problems is pretty widespread. And in some ways having to have something be visually identifiable is buying into a lot of biomedical hegemony. I just don’t see why that should be the criteria for illness. Ultimately it’s a philosophical question. Most people in our society do accept that severe depression actually constitutes an illness category, but I think these kinds of ambiguities leave people unsure whether this is something worthy of very strong medicine. ECT is strong medicine. It’s a big decision to undergo ECT and it’s the right decision for some people. It’s a decision that shouldn’t be made lightly and shouldn’t be treated like a trip to the dentist. I was really gratified by the number of anthropologists who read and used my first book on insanity in Nigeria, Imperial Bedlam (available here), and I would be thrilled if anthropologists gave this book the same attention. And I’d also like to add that Routledge says there will probably be a paperback within the next year and a half.